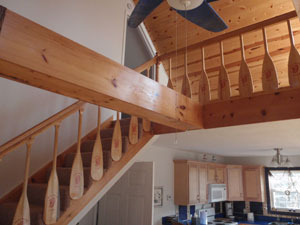 Whimsical decorations of the sea fill this three bedroom & two bath getaway cabin. An inviting open floor plan with lofted ceiling houses the living room, kitchen & dining with one bedroom and one bath on the main floor. 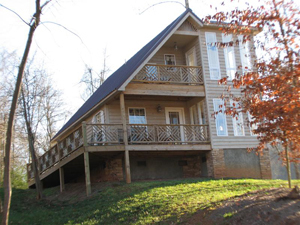 The upper level features 2 bedrooms and a full bath with access to the covered porch. Relax anytime in a rocker on the wrap around porch off the main level. An inviting open floor plan with lofted ceiling houses the living room, kitchen & dining area. There is plenty of seating for you and your guests. Enjoy a nice cup of coffee in the morning while you take in the view. In the evenings, relax and take a load off your feet. 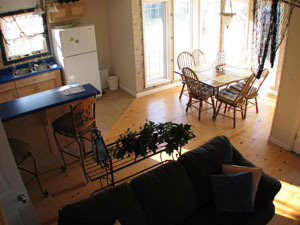 The cabin is equipped with Expanded Cable TV and a DVD Player to watch your favorite movies. 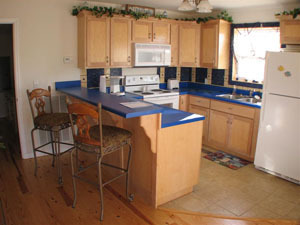 This fully equipped kitchen has full size appliances, no mini fridge or hot plate here! Refrigerator /Freezer, Stove, Dishwasher, Microwave, Coffee Maker, and Toaster. You will also find a Washer and Dryer along with an Iron and Ironing Board. Want to grill a few steaks? There is a nice Charcoal Grill located right outside. 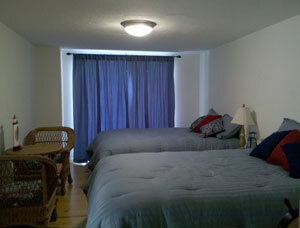 There is one bedroom with two Queen beds and one full bath on the main floor. 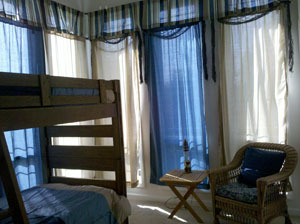 The upper level features a room with a queen bed and a full bath plus another bedroom with a twin bunk bed. The upper level has access to the covered porch. We provide all the linens and towels that you will need. Pour yourself a nice glass of wine and head for a porch. Grab a rocking chair and relax while you converse with your family and friends. In the early morning and early evening we frequently have deer and beavers foraging at our ponds. The upper deck is great if you enjoy bird watching. Did you know that there are 420 different bird species that either reside or migrate through the state. While some of these species only occasionally visit Alabama, any birding trip presents an abundance of bird variety to be enjoyed. Ahoy Maties! 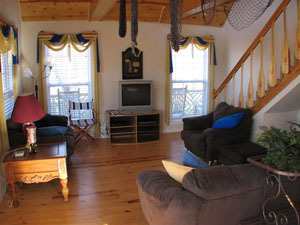 Whimsical decorations of the sea fill this two bedroom & two bath getaway cabin. An inviting open floor plan with lofted ceiling houses the living room, kitchen & dining with one bedroom and a full bath on the main floor. 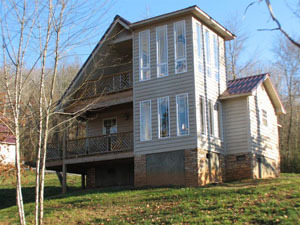 The upper level features two bedrooms and a full bath with access to the covered porch. Relax anytime in a rocker on the wrap around porch off the main level. Catch & release fishing in the ponds on the property, bring your horses for riding or hike on all the wooded acres. Reserve your vacation with us - Captain's Orders! No Smoking and No Pets..
Sleeping Accommodations: 3 queen, 1 twin bunk bed.